Moriah grew up on the mission field in Kenya with her parents, Rev. John and Tammy Juhl. She graduated from Juhl International Academy in 2011 and received a Bachelor’s degree in history from the University of Jamestown, North Dakota in 2014. Prior to attending Lutheran Brethren Seminary, Moriah taught at Juba Christian Academy in Juba, South Sudan. 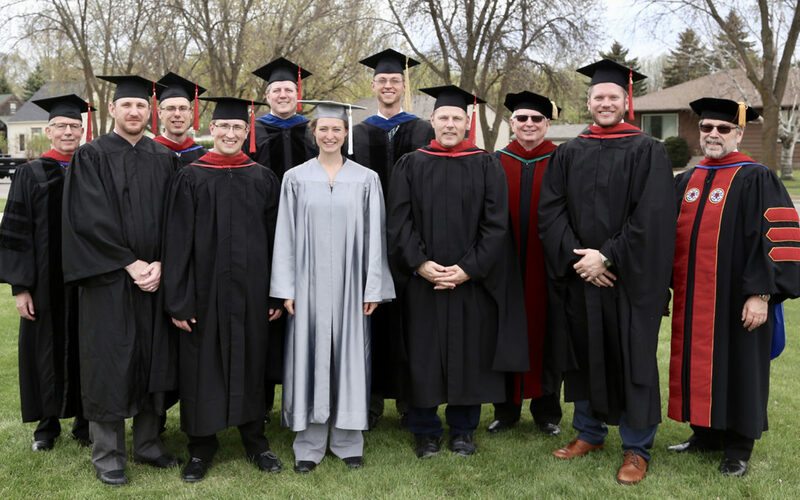 Moriah graduated with a Certificate of Theological Studies with an emphasis in Mission. In the coming year, she plans to continue working in Fergus Falls, Minnesota and in ministry at Hillcrest Lutheran Academy. Greg came to LB Seminary from Camrose, Alberta after having worked a variety of jobs including carpentry, campground management, and in various roles at the Canadian Lutheran Bible Institute (CLBI). Greg is married to Dena and they have four children: Danyel (10), Garrick (8), Jesslyn (6), and Colby (8 months). Greg graduated from Ryley High School and earned a diploma in Christian Ministry from CLBI in 2014. Greg graduated from LBS with a diploma in Christian Ministry. He has received a call to serve as Pastor of Outreach and Community Care at Resurrection Lutheran Brethren Church in Camrose, Alberta. He will start at the Rez on August 1. Prior to coming to LBS, Jon worked eight years in construction management and another three years in full time youth-ministry. Jon graduated from Hillcrest Lutheran Academy in 2001, and from Liberty University in 2005 with a Bachelor’s degree in Elementary Education. He graduates from LBS with a Master of Divinity degree. Jon and his wife Kristin have five boys: Micaiah (8), Gunnar (8), Leif (6), Haakon (4), Oskar (1.5). Jon has been serving since the summer of 2017 as pastor of Word of Life Church in Fort Collins, Colorado, where he will continue to serve. Robert “Bob” Schultz served as a Licensed Lay Minister of the gospel in Estevan, Saskatchewan for seven years before moving to Fergus Falls with his family in 2012 to formally begin studies at LBS. Bob is married to Melonie, and they have three children: Adrienne (21), Bob (19), and Paige (17). Bob finished grade 12 in Prince Albert, Saskatchewan and has completed two years of undergraduate studies (mostly through Minnesota State in Fergus Falls). He graduates with a Master of Divinity degree from LBS. Bob has accepted a call to serve as pastor at Inspiration Lutheran Brethren Church in Breckenridge, Minnesota. He begins his ministry there this summer. Zachary grew up in Menomonie, Wisconsin and attended Oak Ridge Lutheran Brethren Church. He was homeschooled through elementary and high school years, graduating in 2012. He then began online courses at Thomas Edison State College, graduating with a Bachelor of Arts degree in 2014. In 2015, he moved to Fergus Falls and began studies at LBS. He graduates with a Master of Divinity degree. Zachary met his wife, Kari, in 2015 while working on the resident life staff at Hillcrest Lutheran Academy, and they were married in 2017. Zachary and Kari have moved to West Union, Iowa, where Zachary has accepted a call to serve as pastor of Bethany Lutheran Church.